The concordance is used to find examples of a word form, lemma, phrase, tag or even a complex structure. 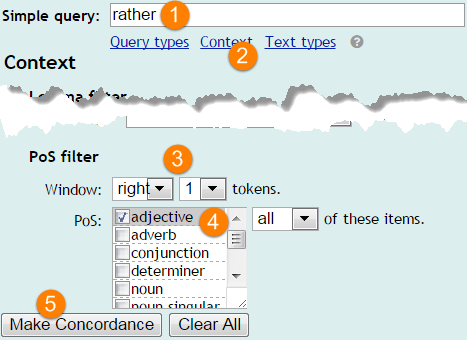 To see examples of a phrase, word form or lemma and click Search to generate a KWIC concordance. To see which words typically combine with the search word, sort the lines by the word that comes before or after the search word. Click Sort Right (1) to sort the lines by the first word after ‘state-of-the-art’. Click Sort for more detailed sort settings. For a more refined search, specify some context. For example, to see adjectives that often combine with ‘rather’, start by clicking Search again and specify the context like this. These settings tell Sketch Engine to find all examples of ‘rather’(1) where the first word to the right of ‘rather’ (3) is an adjective (4). The resulting concordance makes it clear that rather has a strong tendency to combine with negative words. A concordance of ‘rather’ followed by adjectives. Concordances can also be used to search for word or grammatical structures (e.g. sentences where the verb is in the past tense and is followed by an -ing form) This is what CQL is for. To learn more about concordances, please refer to the User manual.